The biotech start-up world is a stage, and all the aspiring entrepreneurs must be performers. 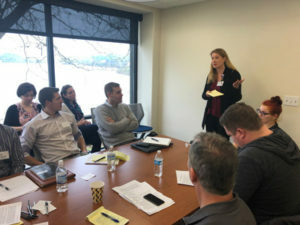 On February 6th, OBI hosted an Elevator Pitch Workshop for aspiring entrepreneurs in the Portland, OR area. 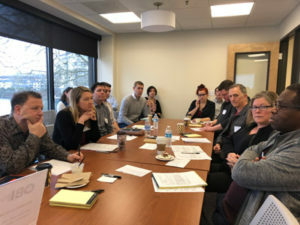 The diverse group of participants included physicians, students, and scientists, each with an idea for a new medical device, technology, or line of research. The workshop was led by Brigitte Piniewski, MD, Oregon Angel Fund investor and advisor to the healthcare start-up Healthcoin, and Tom Kingsley, professional advisor to entrepreneurs and start-ups. Participants also received expert feedback on their pitches from OBI’s Entrepreneur-in-Residence William Newman,, and founder of s2s Public Relations Eric Schudiske. Workshop participants viewed videos of real pitches given by OBI members. The pitches were then evaluated for their strengths and weaknesses, providing a basic idea of what a pitch is and how it should be designed and presented. Tom Kingsley stressed the importance of scripting, revising, and practicing a pitch. Kingsley also gave an example of editing a 100+ word pitch (which was already good) into a succinct, punchy 76 word presentation. After learning what elements a pitch should contain, the workshop attendees were provided with a basic structure for designing their own presentation. Working in groups, they wrote their scripts, practiced their performances, and took the workshop advice to heart and revised, revised, revised. Finally, several lucky participants were chosen to give their pitch in front of everyone in attendance. A new silver-based antibiotic was pitched, as well as a new healthcare technology to monitor and encourage medication compliance. An academic researcher also presented a variation of the business pitch, proposing a new area of scientific investigation. The importance of performance was stressed throughout the workshop. Workshop participants learned that an investor is not just investing in your company, but investing in you. When giving a pitch, you must be passionate, infectious, and exciting. If it doesn’t sound like you believe in your company, you won’t convince anyone else to believe or invest. Each attendee took away from the workshop a foundation of their own pitch, as well as an understanding of how much work, revision, and practice go in to a successful presentation. Tom Kingsley and William Newman have been gracious enough to offer time during our OBI Expert Office Hours program to provide Pitch Coaching and General Business Advice. You can book an appointment with them at Expert Office Hours. 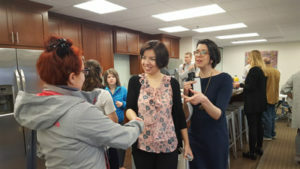 Images from the OBI Invent: Elevator Pitch Workshop: Participants designed and presented pitches, with expert advice and feedback from experienced entrepreneurs and advisors in the biotech industry As always, there was lots of coffee-fueled networking between attendees! 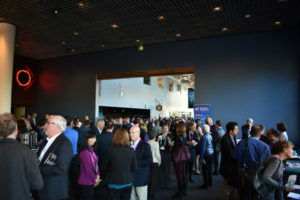 Innovative technologies and entrepreneurial spirit was on display at the Oregon Bioscience Association’s Annual Showcase. The showcase took place on October 30, 2017, at the Oregon Museum of Science and Industry (OMSI) in Portland, OR. 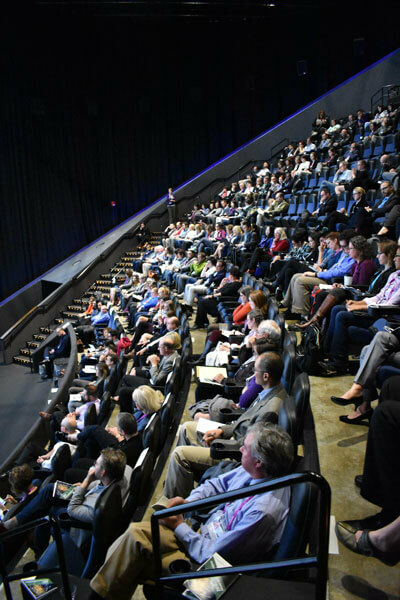 Nine local bioscience startup companies participated in the showcase’s pitch competition, competing for the chance to advance to the next event in Seattle. Additionally, 12 researchers ranging from high-schoolers to the postdoctoral level competed in a research fast-pitch competition. Several important guests attended the event to show their support of Oregon’s burgeoning bioscience sector. 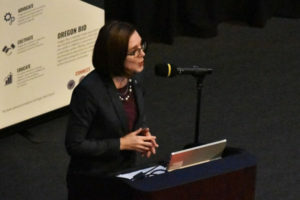 Oregon’s governor Kate Brown called the bioscience industry “a rich and thriving sector taking root in Oregon,” and she praised the participants as vibrant mavericks and entrepreneurs. She also highlighted economic impact, noting that the bioscience industry has created 46,000 jobs and over $10 billion of revenue for the state, reflecting a 68% increase since 2002. Congresswoman Suzanne Bonamici spoke as well, emphasizing the bioscience industry’s ability to improve lives and also stressing the importance of investing in basic research and STEM education. 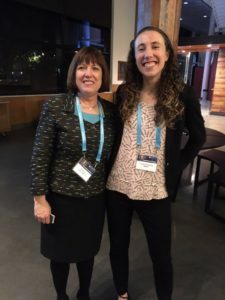 The showcase was sponsored in part by the Oregon Translational Research and Development Institute (OTRADI), home of the Oregon Bioscience Incubator (OBI). Part of OBI’s mission is to grow Oregon’s healthcare innovation sector, facilitating investable technologies and improved patient outcomes. This mission was evident in the presentations given throughout the day. Two themes in particular were exhibited by the startup representatives as they presented their goals: 1) improving aspects of healthcare for traditionally underserved populations, and 2) advancing the personalization of medicine. One of the winning companies, Madorra Medical (an OBI start-up), developed an ultrasound device to treat vaginal dryness and atrophy. Vaginal atrophy (thinning and drying of the vaginal tissue) is a serious medical condition caused by decreased estrogen levels, and is commonly experienced by women who are breastfeeding, post-menopausal, or breast cancer survivors. For the 14.4 million US women suffering from vaginal dryness, the condition severely impacts quality of life by causing constant pain and impeding sexual activity. The only treatment currently available is estrogen therapy, and, due to hormonal complications, this is not an option for breast cancer survivors or breastfeeding mothers. Advancement in women’s reproductive healthcare has traditionally lagged behind other fields of medicine, with treatments developing at an incremental pace and misunderstandings (even among healthcare providers) about what is normal. Madorra’s ultrasonic device helps to address this gap by providing an alternative to hormone therapy, and allowing women to treat vaginal atrophy non-invasively in their own home. Madorra’s hope is that their technology not only improves quality of life, but also empowers women to take control of their health. Several other companies also sought to reach underserved populations with their technologies. The winning startup, Hemex, has developed technologies to efficiently diagnose malaria and sickle cell disease. Their diagnostic tools are significantly faster and less expensive than current methods, able to detect malaria in under a minute for less than $1 per test. Hemex’s advancements promise to improve quality of life and ease the burden of these diseases in developing countries. Another finalist, Sonivate, is advancing medical care for soldiers in the field and patients outside of a hospital setting. Although ultrasound is a crucial component of emergency medicine, it has traditionally not been available in the field due to the large size and non-portability of available devices. Sonivate has addressed this problem by developing a small, portable ultrasound device for use by military medics, EMTs and paramedics. Other companies presented technologies and devices focused on personalizing medicine. For example, APDM has designed wearable sensors for tracking motion in movement disorders (such as Parkinson’s disease), which will accurately assess progress and allow tailored treatment for individual patients. Owl Insights, Inc. has a similar goal for the behavioral health field. OWL has developed a program that allows patients and providers to work together to efficiently track patient progress and treatment efficacy. Finally, NemaMetrix presented what is perhaps the ultimate technology for personalization of medicine. This startup created a diagnostic tool utilizing microscopic worms. These worms can be genetically modified to express a person’s genes, and can then be used to screen drug treatments for safety and efficacy for an individual patient. This technology will benefit a traditionally ignored population—patients suffering from “orphan diseases,” (rare diseases that receive little research and attention). Prior to the showcase, OBI provided advice and coaching to the competing startup companies, including a 2-day pitch workshop, in which the startup representatives honed their presentations and learned what the judges would be looking for during the showcase. Holly Rockweiler, co-founder and CEO of Madorra, finds OBI’s community and resources supportive as well as conducive to the growth and success of her company. She says that overcoming each obstacle in the startup process is like “climbing a mountain in a mountain range.” You know there is always going to be another mountain ahead, but you focus on the one you are currently climbing, and trust that you will be able to make it over the future obstacles as well. This entrepreneurial spirit was on display throughout the day at the Bioscience Showcase, and it is this spirit that will make Oregon a leader in the future of healthcare and biotechnology.